Place 2 gallons of cold tap water into sanitized Frostline mixing bucket. Stir in flavor packet (60 g) with a whisk. 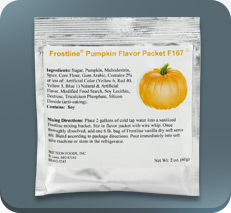 Once thoroughly dissolved, add 6 lb bag of Frostline dry soft serve mix. Blend according to package directions. Pour immediately into soft serve machine or store in the refrigerator.